Shopping for a new Gas Grill – Weber for the Win! Before I jump into the research, I’ll explain my choice. The Weber Spirit E-320 model met all the needs I had for a grill except for the price. I decided it was worth the additional $150 to get a better quality grill. You can read more about specific features else where. Some of the big items for me was the side burner, solid aluminum construction, enclosed area for the propane, and heavy chassis. In addition, you can find many parts/accessories to customize this grill if you ever wanted to. The grill comes with porcelain coated iron (see note below) grates, but you can purchase 1/4″ thick stainless steel grates as well. I also liked how the drip pans worked. As far as maintenance is concerned, this grill should be rather low compared to most. I did a lot of research on grills and I sure learned a lot. I used the following factors when I considered each grill: customer reviews, grilling features, quality and priced under $400. I will not waste anytime further in the quality issue, I quickly discovered that if you want a quality grill you’re going to have to pay for it. As for quality, I judged the construction of the grill chassis (legs, wheels, etc…) to determine the quality. The only grill under $400 I could find that actually felt sturdy are the Weber Spirit E series models. All the other grills I looked at would easily flex/bend. The grilling surface (also referred to as the grates) was one other factor, which I quickly discovered the quality of the grate wasn’t necessarily associated with the price of the grill. For grilling features, I primarily want to use the grill for cooking hamburgers, steaks and hot dogs. Chicken, pork, fish and other meats are secondary. Heather also expressed interest in having a side burner in case we wanted to use it for cooking something in a pot or pan. Based on research, either stainless steel or porcelain coated cast iron grates are preferred for grilling. The wider the grill lines the better. Narrow/thin grates will not cook as well or hold the heat for as long as thicker ones. The heat plates are also a factor (I explain these a couple of paragraphs down). Grills seem to pride themselves on is the number of “burners”. I think this number should be relative to the size of the grill, but many brands sell essentially the same size featuring between 2 to 6 burners. I decided to eliminate this as a feature that improved the grill over another. Grills do not seem to advertise their heat plates (Weber calls these Flavorizer Bars) very well (this is the metal or porcelain coated iron/steel covers over the burners). When comparing grills, take off the grate and look at the construction that is immediately under the grates. You should be able to easily remove a plate of some shape (usually shaped in an upside down V or oval with the edges running down like a roof). You will need to remove and clean these on occasion. Many of the sub $150 grills don’t even have such plates, which means the flames from you burners could directly hit your grates and food during grilling. I did not include my opinion of the heat plates below since I don’t have any cooking experience on any of these grills to know which design is better/worse. But All of the grills have some sort of heat plate. The Weber brand grills had the best customer reviews. The quality of the construction and materials uses in the chassis also topped my list. Price though scared me away from all but the Spirit E-210 model initially. 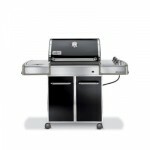 Spirit E-210 ($400 retail): This grill met my primary requirements, nice grates and quality. This grilldoes not include a side burner. Spirit E-310 ($500 retail): Essentially a slightly larger version of the E-210 model, it also does not include a side burner. Spirit E-320 ($550 retail): This grill is perfect for what I am looking for except that the price, $150 out of my range. Grillin Pro 3001 ($214 retail): The quality of this grill just fell flat. It does have porcelain covered iron grates, but the thickness of the grates and the quality of the coating is a bit of a disappointment. For a grill in the same price range, the Kenmore and Brinkmann models are better. Doing some research I found that most all of the Kenmore brand grills are manufactured by Ghar Grill. They are unique however, there are no models that are labeled with both brands that I could find. 4 Burner Gas Grill ($250 retail): A friend of mine owns a similar one to this grill and he loves it. I took a look at a model slightly more expensive and found that the materials for the grill chassis has been rather cheapened compared to my friends older model. I could only find one review online where someone mentioned that the materials used in the Kenmore Grills was cheapened in order to lowre cost. I’m not sure how true that is, but the quality of the grills you can buy today in this price range have rather cheap construction. Both the chassis and the grates seem to be of a better quality than of their Char Grill counter parts. There are other variations of this same grill on Sears.com. I’m not even going to link to the models. These are pretty cheap grills and the grates show that. Main thing that turned me away instantly was the steel coated porcelain grates. 4 Burner 810-8411-5 ($200 retail): Not a bad grill, quality of the construction was the best out of all of the grills I looked at that were $under $300. Unfortunately, it still was not as rugged. The grill itself felt rather light weight, so light that it could flip over easily in moderate winds. The grill was very large as well, so if you’re interested in the largest grill for your buck, then this grill may be for you. Affinity 3100 ($475 retail): Very similar to the Weber E-310. Affinity 3200 ($512 retail): Very similar to the Weber E-320. I was unable to find a retailer in the area that sold this brand grill. I later found on-line that Ducane is a subsidiary of Weber. Customer reviews are about as equal for this brand as they are for Weber. If you can check out a Ducane grill, please leave a comment of your thoughts on them. There are a lot of grill options out there. Had I not been able to pay the extra $150 for the Weber E-320, I would most likely have gone with either the Kenmore 4 Burner or the Brinkmann 4 Burner grills. So what kind of gas grill do you have? Do you like/dislike it? Do you recommend a brand or model? The Weber Spirit E-320 grill sold on Amazon.com does not come with porcelain coated “iron” grates. It appears the only Weber Spirit S-320 sold exclusively at Home Depot includes porcelain coated “iron” grates. The special S-320 from Home Depot is only $30 more and comes with both iron grates instead of steel and stainless steel through portion of the grill lid. If you want iron grates, this is the best deal. If you’re like me and saved money on shipping ordering from Amazon.com, you can get a set of Iron grates for $70 online and have 2 sets of grates. From what I read, the iron grates and the steel grates have different advantages. The steel warms up much faster so if you’re doing some quick cooking the steel may be better for you. ← Skyline Chili Connoisseur Club Tweetup Today!